Sunday’s final stage has an interesting profile. At a swift glance, it appears to be incredibly flat, but on closer inspection, from 90km to the finish at kilometre 198, the riders will either be ascending or descending, with no real flat in sight. The race takes in three ascents of the infamous Muur, a cobbled climb of just over 1km at a gradient of 8.7%. After three full ascents, the finishing line is situated half way up what would have been a fourth climb of the Muur. Riders with experience in the Spring Classics will be well aware of what lies ahead. Current race leader Rohan Dennis may not be as well versed. Whether this affects his grip on that white jersey remains to be seen. Freewheeling prediction – The final day of racing is a difficult one to predict, due to the many narrative threads running throughout the race. The riders at the sharp end of the GC are not separated by huge gaps, so someone like Tony Martin, 24 seconds back, could decide to throw caution to the wind on the last day and try a courageous attack. Any attack here would be courageous given the terrain – those cobbles on the Muur are no small matter! The technical nature of some of the climbing could give pause for thought to those riders with World Championship hopes, as no one wants even the most insignificant of injuries to interfere with preparations for Qatar. On Stage 6, Sagan seemed less concerned with claiming the leader’s jersey, perhaps instead targeting stage wins. Tony Martin of Etixx-Quickstep attempted an attack as he chased down 24 seconds. BMC were keen to protect Dennis, but will his lack of Classics experience impact upon his tactics on the final day? And where have Tom Dumoulin and Greg Van Avermaet been? All these questions and narratives make for one interesting day of racing, that’s for sure! Hedging our bets? Maybe. But the unpredictability is what makes this final day so special and exciting! The two final days of this year’s Eneco Tour look set to bring the big GC contenders to the fore. Stage 6, at 197.2km, contains six climbs, starting at Riemst and hugging the Dutch border before ending at Lanaken with an uphill finish. The organisers have packed the climbs onto the route in quick succession, with three short, sharp ascents fitted into 7km of road. The current GC standings and time gaps should see plenty of attacks, suggesting that Stage 6 could be an exciting day of racing. The Golden Kilometre is once again located on a hilly section, a stroke of genius if exciting racing is what you want. The concept was first trialled at the Tour of Belgium; the idea being that three intermediate sprints are contained within one stretch of road, 1km in length. For each sprint, time bonuses are awarded – 3 seconds for the leader, 2 for second place, and one second for third. For the leader therefore, 9 seconds are up for grabs, making it possible to win or lose a race based on time bonuses earned by racing for Golden Kilometre points. Freewheeling prediction: Another nice stage for Sagan, but aren’t they all these days?! The current GC placings will certainly make for some exciting tactical racing. Without the Golden Kilometre time bonuses, Rohan Dennis might have been more comfortable about remaining in the leader’s jersey, however if Sagan goes for it, he’ll regain the top spot on GC by the end of the day. When I first looked at the last two stages, I felt that Geraint Thomas and Greg Van Avermaet might be top three GC riders by the end of this stage. I’m no longer sure about Thomas, who, whilst riding well, looks to be steadying himself for Qatar. Tom Dumoulin appears to be riding into form as Eneco progresses, and I’d expect him to try something on Stage 6. Sagan, Van Avermaet and Dumoulin for me, with Dennis chasing the relevant breaks to protect his lead. Wow, that’s two days in a row where the Freewheeling prediction has actually been spot on! As predicted, Stage 4 was the perfect terrain for another Sagan win, and, as predicted, the Tinkoff rider and newly crowned European Champion took the race leader’s jersey. Sagan has won so much this season that it’s actually a rare sight to glimpse him in his Tinkoff jersey these days! Setting out from Aalter, four riders got into an early break, building up a steady lead of four minutes. The first appearance of Belgian pave soon put an end to their hopes however, with the lead diminishing. The circuit was where the action was expected, and on entering this section of the race with 64km remaining, the bunch came together. Riders were to make 2 laps of the 32km circuit, which, as well as two pave sections, also had two climbs and a smattering of uncategorised cobbles. Tom Dumoulin made a move and a group of six riders came off the front as a result. This shook up the peloton, who sharply shut the break down. After that, numerous riders tried and failed to form a sustainable break. Rohan Dennis and Edvald Boassen-Hagen found themselves in one of these unsuccessful breaks, which formed as a result of the climbs. Dimitriy Grazdev and Andriy Grivko of Astana looked to be in with the best chance of a successful breakaway, but this too was eventually shut down with 3km of road left. 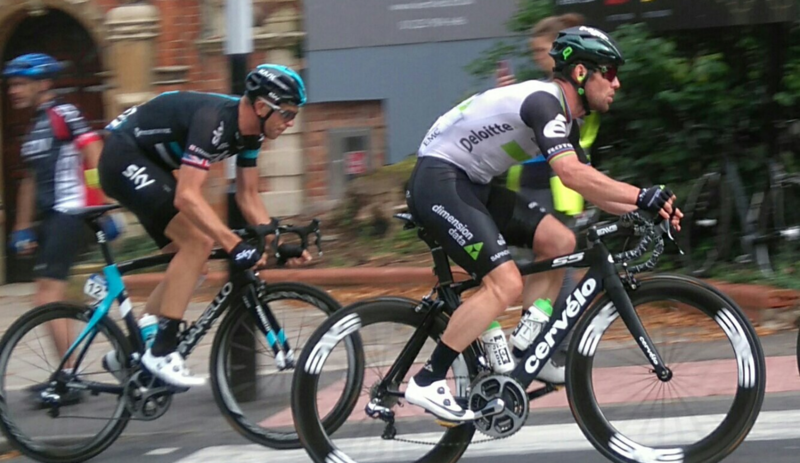 The second lap saw another push from Dumoulin, who had joined Tony Martin up the road. With two strong riders, the break looked to be promising, but the pair were unable to join the two Astana riders ahead of them to consolidate the move, dangling like a carrot in front of the peloton and never quite managing to bridge the gap to the men up the road. Eventually, the 8.2% gradient of Bruine Put saw the pairing sucked back into the bunch, however Trek-Segafredo rider Jasper Stuyven leapt off the front to join Grazdev and Grivko. The sprint itself was not without drama. Katusha’s Alexander Kristoff started the action, and Sagan and Andre Démare of FDJ fought for his slipstream, resulting in a bumping of shoulders and jostling. Greipel meanwhile, had been set up by his Lotto-Soudal team mates to try for a sprint victory. The German powered across the line, only missing out on the win by a whisker in a photo finish. Neither Sagan nor Greipel was sure of the result initially, waiting for the finish line photograph to be analysed before Sagan was pronounced the victor by virtue of a bike throw. Démare was evidently unhappy with the outcome of the sprint, which Sagan addressed after the race. “There are some riders who are not happy…I had a little problem with Démare, but that is sprinting. If I did something bad, I’m sorry, but I don’t think I did. I was in my line and he was very aggressive to me”. There was drama elsewhere on the stage: his attention momentarily diverted by consuming a gel early in the race, Etixx-Quickstep’s Tom Boonen hit a pot hole and was thrown from his bike. Boonen remounted but couldn’t continue, abandoning shortly after. Team manager Patrick Lefevere explained that Boonen had felt ‘dazed’ after the incident, and was taken straight to hospital. After an x-ray, Boonen was permitted to return home and rest. At the present time, no comment has been made on whether or not this will affect his World Championship preparation. As if that weren’t enough, an incident with a motorbike on a roundabout late in the race almost wiped out the three leading riders. The motorbike took a wide line around the roundabout, losing control after hitting the street furniture and careering from right to left across the road, directly across the path of the three cyclists exiting the roundabout on the left, who thankfully managed to avoid being struck by mere centimetres. The incident comes after Etixx-Quickstep’s Tony Martin praised the Eneco Tour on his Twitter page, writing “with intelligent diversions no motorbike has to pass the peleton” (sic). For two seasons, incidents involving official race motorbikes have marred events, culminating in the tragic accident earlier this year at Ghent-Wevelgem where Antoine Démoitié sadly sustained fatal injuries after crashing and then being hit by a race motorbike. The Eneco Tour had impressed riders by introducing diversions for race traffic at pressure points on the road; however this latest incident in a supposedly safe race underlines the need for the UCI to truly investigate ways to ensure rider safety. Stage 4 is the longest in this year’s 12th edition of the Eneco Tour, with 202km of racing between Aalter and Saint-Pieters-Leeuw. Billed as a sprinters stage, the appearance of three uphill sections within the circuit, the last of which tops out within the final 13km – may decide otherwise. If the climbs aren’t enough to contend with – enter the Belgian cobbles! The pavé sections here are not too long, although could be tricky depending on the weather conditions. The riders will also have to contend with three climbs included within the circuit section, which could see the bunch split. To make things interesting, the Golden Kilometre begins just after the final climb of Bruine Put – a climb of almost 1km at 8.2%, which, given the time gaps at the top of the GC, could make for a very entertaining few metres as BMC seek to hold off Sagan and keep Dennis in the leader’s jersey. With its technical sections, uphills and sprint-type finish, this should be another perfect stage for Sagan. Only 3 seconds behind the race leader, day 4 could be the day for the Slovak to head GC for the first time in the race. Freewheeling prediction – Fresh from our prediction success in Stage 3 thanks to Sagan and Boudhanni, Freewheeling is predicting that Sagan will take over the leader’s jersey by the end of Stage 4. There could be another stage win for the Tinkoff rider given the shape of the parcours, although Olympic champion Greg Van Avaermaet is also in good shape to finish the stage at the sharp end. Stage 3 of the Eneco Tour looked to be in the hands of a five man breakaway until the last 100m when the break wavered, lost momentum, and relinquished their opportunity to the chasing peloton. Martin Elmiger of IAMCycling started the day 23 seconds behind race leader Rohan Dennis, and by getting into the break almost as soon as the race began, spent much of the afternoon as the virtual race leader on the road. Elmiger was accompanied by Brit Mark McNally of Wanty-Groupe Gobert, Jesper Asselman of Roompot Oranje, Yukiya Arashiro of Lampre-Merida and Stijn Steels of Topsport Vlaanderen. At one point, the leaders were ahead by over 6 minutes. As the leaders passed under the flamme rouge, the peloton still had their work cut out on the chase – especially given the fact that no one team was keen to commit to reeling in the five leading riders. Frustration began to simmer in the peloton as the sprinters’ teams got edgy. Etixx-Quickstep sent Tony Martin to the head of the bunch to chase in earnest, a role he didn’t seem exactly pleased to be asked to fulfil. With the finish line in sight and 100m of road left, the breakaway hesitated, looking at one another and appearing to have lost all sense of race tactics. Seizing this opportunity – the only one they’d been presented with all day, the peloton took the initiative and swept up the five leaders. Sagan, coming from well back, managed to glide through gaps visible to no-one but the Slovak rider, as his bike handling skills saw him sail across the finish line for victory, in an unbelievable sprint which social media was quick to christen ‘the finish of the season’. Team Sky’s Danny Van Poppel crossed in second place, with Nacer Boudhanni of Cofidis in third. Sagan’s winning time of 4:10:36 sees him move up to second in GC, 3 seconds behind race leader Rohan Dennis, who retains the leader’s jersey going into day 4. Alex Dowsett of Movistar is the highest placed British rider in 11th place, with Tony Martin and Tom Dumoulin in 14th and 15th place respectively, 20 seconds back as a result of losing time on Tuesday’s TT. Dumoulin had been enjoying a rich seam of form – perhaps his heavy race calendar and numerous top 3 placings have taken their toll as the seasons draws nearer its close. Tomorrow, Stage 4 – the only one to top 200km, takes the riders across numerous stretches of Belgian pave, with three uphill sections on the circuit, including Bruine Put at 8.2%. Stage 3 begins on the Belgian coast at Blankenberge, hugging the shore until Ostend before heading inland to Ardooie. Unless a breakaway can gain a big enough lead before reaching the Belgian town, the stage seems destined for a sprint finish. The circuit of Ardooie is actually pretty technical, with some tight corners to navigate before a straight 1km run in. The technical aspects of the final urban circuit may make organisation difficult, however these are the types of finish which Sagan will relish with his exquisite bike handling skills ready to come to the fore. Freewheeling Prediction – Sagan looks to be the likely beneficiary of the technical corners in the final circuit. After backing the Cofidis boys for an outside chance with Nacer Bouhanni on Stage 1, don’t bet against them on this stage either. Bouhanni was close on the first day, and he has won here before in 2014. Tuesday’s Stage 2 time trial in Breda was won by Australian national TT champion Rohan Dennis in convincing fashion. Dennis’ win on the 9.6km course puts him in the race leader’s jersey by 5 seconds from LottoNL-Jumbo rider Jos Van Emden, who took second place on the stage. Pre-stage favourites Tony Martin and Tom Dumoulin were off the pace, coming in 20 seconds behind Dennis. The short stage allowed the sprinters to finish strongly, with Sagan securing a top ten position in 8th place in a time of 11.05, and Kittel in 9th. Movistar’s Alex Dowsett rounded out the top ten. Dennis was pleased with his commanding performance, which bodes well for Stage 5 and the Team Time Trial. “I took all the risks and kind of crossed my fingers every time I went through a corner…Today was as quick as I could possibly go”. Sagan’s top ten finish saw him move up to third place in GC. “He was the main guy that stressed me out” explained Dennis, “I was worried about him once Tom Dumoulin and Tony Martin had gone through”. Dennis’ BMC Team are now in a solid position, with Dennis confirming “we’re here to win with either myself or Greg (Van Avermaet)”. Reigning World Time Trial champion, Vasil Kiryienka, didn’t have a great day, arriving at the start ramp 45 seconds behind his allocated time slot, meaning the clock had started without him. Rohan Dennis therefore set off only 15 seconds behind the Sky rider, overtaking him near the finish line. Dylan Van Baarle was also late starting. Tomorrow the race enters Belgium, with a route of 186km from Blankenberge to Ardooie. The sprinters will once again be hungry for a stage win on rolling roads, although there may be a chance for a breakaway if riders can organise to hold off the peloton.